I never realised the value that Nikki could bring to my wardrobe (and my life!) until I had my session with her, and I really wish I had done it sooner and fitted in more shops with her before she left London. Before our shop, her consultation on my existing wardrobe gave me so many new ideas about my clothes and got me excited about dressing again, even before buying any new clothes. Nikki was so well prepared and she understood my body and my style so well, that I ended up buying at least 80% of the clothes she selected for me to try on. Not only did she choose things that I immediately loved, but she also stretched me to wear beautiful pieces that were slightly outside my comfort zone that I quickly grew to love. My personal shopping experience with Nikki really opened my eyes to how I could and should be shopping, and I will be the first to book a slot in her schedule every time she travels back to London for a work trip. Thank you so much for everything – it has made such a difference to my confidence and made leaving London so much easier knowing I had an awesome wardrobe to take with me without having to scramble for new clothes in a strange country! I absolutely love my wardrobe – it is so me! I am ready far quicker in the mornings and feel so comfortable through out the day! I feel so much more equipped to go out on my own but honestly I prefer shopping so much more with you! I hated it before! So even though I live a continent away you definitely haven’t heard the last of me! It has been a pleasure knowing you Nikki! I initially contacted Nikki to help me chuck out clothes I had been hording for years and build a honeymoon wardrobe. Nikki was brilliant. We went through every item in my cupboard and she very honestly gave her opinion on what should stay and go (think SATC!). Nikki very quickly pointed out where I was lacking in some basics (for honeymoon, work and weekend outfits) and pulled together shopping list. I loved my day out shopping with Nikki, she gave me the confidence to wear things I would never ordinarily pick and not only did I love my new fashionable wardrobe but still get so many compliments about my outfits. It has totally changed the way I shop too. I was so thrilled we went for a second day out a few months later, this time focusing on an autumn/winter wardrobe. Nikki will ensure you keep to your budget too (although I changed that a couple times). I look forward to the next outing. much Nikki. Nikki helped me find an outfit for my son’s first birthday bash. I wanted to look casual and effortless, and needed to be able to get dirty with the kids, but Nikki managed to find the balance where I still felt like a million dollars and I received numerous compliments throughout the afternoon. I felt and looked just like the glam mummy I was hoping to be! Spending the day with Nikki was my first ever personal styling experience and I absolutely loved every minute! I have always been a bit of a comfort dresser and found it quite hard to find clothes that suited my shape and size and forced me out my comfort zone. 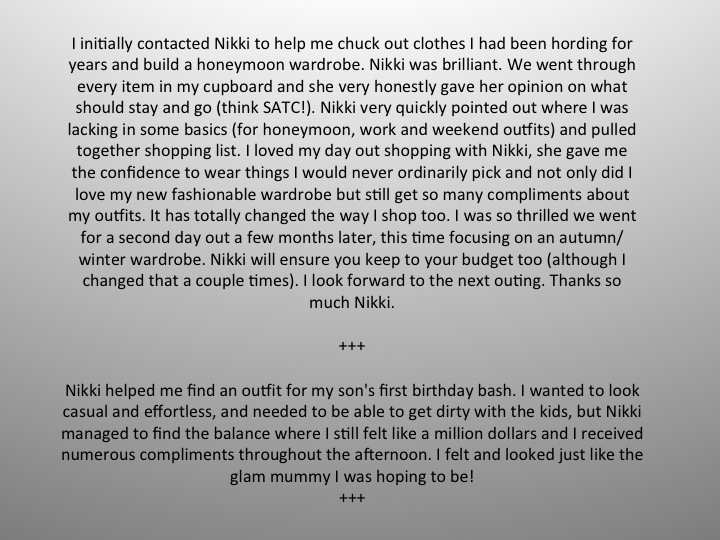 Nikki helped me find outfits that were flattering, comfortable and versatile and her warmth and personal approach made me feel at ease at all times. I love my new wardrobe and I feel fantastic every time I put on one of my new garments! She is a genius when it comes to styling and the overall experience has been hugely liberating and given me the confidence to choose clothes that really work for me. Nikki, thank you for such a rewarding experience and sharing your invaluable knowledge, I had the most amazing time! Thanks to numerous mood boards, shopping trips and Nikki’s great advice and guidance I now have a wardrobe filled with clothes that make me feel more confident both in the workplace and at home! Thanks Nikki! I can’t wait to get started on my Spring wardrobe. For years and years my cupboard bothered me: far too many clothes with nothing to wear. Every morning I would get completely over-whelmed about what to wear so would often just pull on the old faithful or something new I’d bought. I always struggled to get rid of things as couldn’t handle the thought of letting go of something I paid so much money for and was convinced, “I’m sure I’ll wear this one day”. One night at a book club though, the famous Nikki was recommended through a friend who just raved about her services. Nikki very kindly squeezed me into her busy schedule and we spent two days together, which literally changed my life. After throwing out four bags of never worn/ miss-fitting clothes, I was left with a brand new wardrobe of outfits I didn’t even know I had! Nikki spent hours with me showing me what to wear with what, how I should dress for my body shape, what colours and styles suited me and what I should never buy again! Not only did she do all that, Nikki put together mood boards for me of new styles and looks I would never dream of wearing! Since my experience with Nikki, I have received more comments on my outfits than ever before and actually now get excited to get dressed in the morning. I genuinely can’t recommend Nikki highly enough. Not only is she such a pleasure to work with, she has an incredible passion for what she does and is absolutely brilliant at it. I couldn’t recommend Nikki more! Shopping with her was such a pleasure and so successful rather than a waste of time that it normally is. I now have a gorgeous wardrobe that suits me and is easy to put together. I also probably spent half of what I would have on clothes I would never have worn if I shopped on my own. Nikki I will definitely be asking for your help this summer.